We can only hold off so long on replacing plumbing fixtures. It wouldn’t be a good idea to wait until the bathroom faucet starts leaking water all over the place. But we are all trying to save money any way we can but that doesn’t mean we can’t get the replacement faucet for a great price. If you are like a lot of people you are shopping online. If you have ever been to a plumbing fixture website you will notice that the most expensive fixtures are placed in the front of the website. You have to really take a few more minutes and search the website for the less expensive.We can offer you a list of great bathroom faucets for under $ 50.00. So now you can repair that leaky bathroom faucet for a price you can afford. 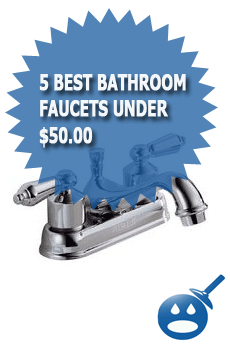 Let’s take a look at some of the best bathroom faucets under $ 50.00. These faucets are from companies such as Peerless, Price Pfister, Delta and Aqua Source. The Peerless Chrome Single Handle Bath Faucet comes with a Clear Knob Handle that is easy to grip and easy to turn. The faucet is made from a Chrome finish that works to protect the faucet from sediment and rust and corrosion. This style of faucet is labeled Contemporary from Water Sense. The Peerless Chrome Single Handle Bath Faucet is a 3-hole installation with an IPS Connection. The Peerless Chrome Single Handle Bath Faucet is a simple yet classic style bathroom faucet that doesn’t have any of the fancy accessories like a Pull Down Sprayer or a Soap and lotion Display. The faucet comes with a cover plate and a plastic pop up drain assembly. The price on the Peerless Chrome Single Handle Bath Faucet is very affordable and costs about $ 24.00. The Peerless Polished Brass Two Handle Bath Faucet is a classic yet elegant looking bathroom faucet. The Peerless Polished Brass Two Handle Bath Faucet has Polished Brass lever handles that make turning on and off the water easy especially for people who suffer from arthritis and other muscle conditions. The faucet is protected by the Polished Brass to ward off sediments and tarnishing. The Peerless Polished Brass Two Handle Bath Faucet Model P99673-PB-L is a 4″ Centerset installation. It has an IPS connection type for easy installation. The bathroom faucet is perfect for any bathroom decor. You may pay a lot more for a Polished Brass finish in other manufacturers but the Peerless Polished Brass Two Handle Bath Faucet Model P99673-PB-L is extremely affordable and costs around $ 49.00. The Delta Chrome Double Handle Bathroom Faucet offers a classic yet contemporary style. This faucet will look great in any decor you have. The Delta Chrome Double Handle Bathroom Faucet has a great design that has some detail that adds a bit more elegance than other faucets. The Delta Chrome Double Handle Bathroom Faucet has a washerless stem cartridge style. This is a standard spout faucet that works with bigger sinks and smaller sinks too. 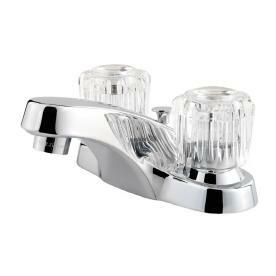 The Delta Chrome Double Handle Bathroom Faucet is a 4″ Centerset with a Chrome Finish. The connection for installation is IPS and a 3-hole installation. This faucet has a chrome finish that will help protect against rust, corrosion, sediments and tarnishing. 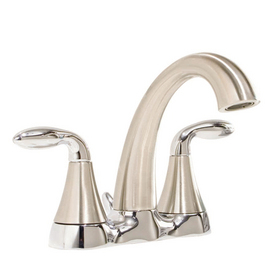 The Delta Chrome Double Handle Bathroom Faucet is affordable and priced at $ 34.86. Price Pfister is one of the most popular brands in plumbing fixtures. The Price Pfiseter Chrome Double Handle Bathroom Faucet is a pop up drain. It has a 3 hole, 4″ Centerset installation. This faucet comes with a double handle faucet which is easy to turn and easy to grip. This faucet is a classic style bathroom faucet that will look great with any bathroom decor. The Price Pfister Chrome Double Handle Bathroom Faucet Model WL2230C is a traditional bathroom faucet. This faucet comes with a Limited Lifetime Warranty, it is important to read the instructions to see what the warranty includes and if you have to register the warranty. 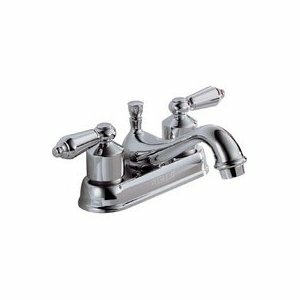 The Price Pfister Chrome Double Handle Bathroom Faucet offers a threaded pipe connection and easy to read and easy to follow installation instructions. The AquaSource Polished Chrome Double Handle Bathroom Faucet offers a classic yet traditional style bathroom faucet. This faucet is made from a strong and reliable construction. This faucet comes with a 4″ Centerset installation. The faucet comes with installation booklet and warranty information. This faucet uses 30% or more less water than other faucets but you will not lose the power that goes with it. The AquaSource Polished Chrome Double Handle Bathroom Faucet is a 3-hole installation with a threaded pipe connection and a Polished Chrome finish. The Water Sense labeled these faucets as Commercial. These faucets are basic style and they costs about $25.00. There is nothing wrong with trying to beautify your home but for many people they cannot afford to beautify much less repair. So if you are looking to simply replace the leaky faucet in the bathroom that hasn’t been changed since the dawn of time, you don’t have to spend a lot of money in doing so. If you shop online, make sure that you really check into the websites inventory because they tend to hide the less expensive faucets and place the higher end faucets up front. Stores do the same thing, so make sure that you take some time and really do your research. You could really end saving a lot of money. You can find some really great styles of bathroom faucets for less than $ 50.00. All you have to do is look and you will find a goldmine hidden in the websites of some of the most popular manufacturers. The Aquasource faucet has a design flaw that really causes problems down the road. In the handle, between the handle and the flared escutchen, there is a pot metal bushing that will corrode and stick the handle to the escutchen. This will cause you trying to turn both pieces in order to operate the valve stem. After a while tou will have a hard time turning on your faucet. 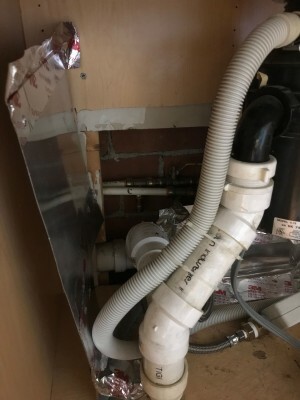 just yesterday i installed yet another shower faucet 3 handle chrome ,Aquasource model#3011507cp ,the only way the handle can touch the escutheon is if the body of the faucet has been installed to far into the wall;sounds like install problem…. Luke to cold water no matter what adjustments I make to 2 valves on either side of brass fixture. Water hot in the rest of the unit. Shower and tub never hot. Just installed the AquaSource 2 handle polished chrome bathroom sink unit with pop-up drain. ($27.00 @Lowe’s) I have installed many faucets/pop-up drains in my lifetime (55yrs)and this one was the easiest to date. Nothing wrong with modern plastics for waterways -they hold up well and no corrosion. Did not require any sealants/tape – is water tight – smooth operating valve handles. Buy one!